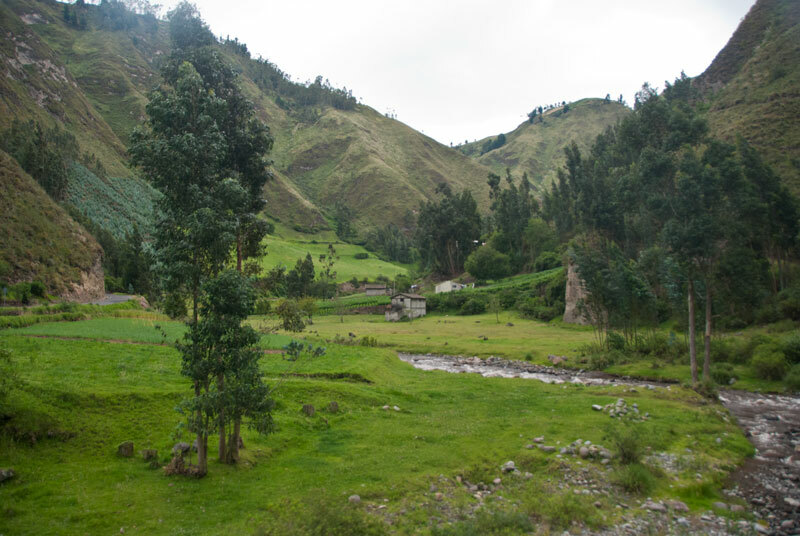 We four Travelers were up early, packed up Frodo the truck, and set out toward Quito. 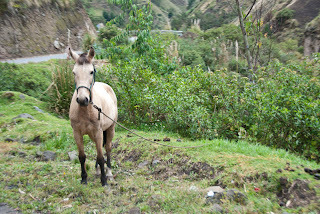 Traveler Thirteen drove us up and up winding roads on our way to the main highway. As we gained elevation the cloud forest disappeared and was replaced by dry highlands. The folks at Bellavista were nice enough to pack us a boxed breakfast, which we ate as we drove. 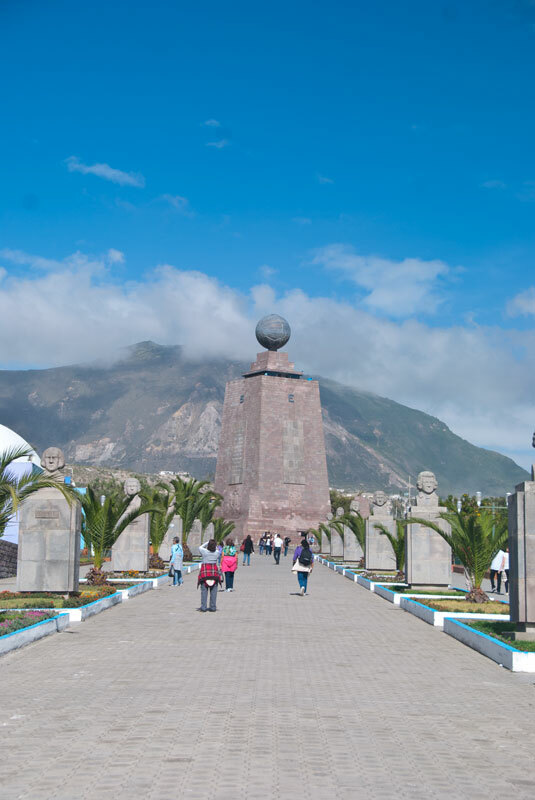 Our first destination: the Equator. 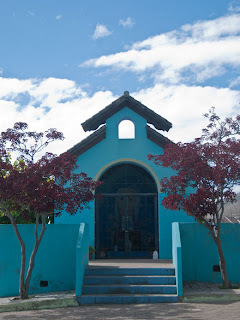 We arrived in the outskirts of Quito, Pichincha to be exact, at the Equator monument a bit early so we had second breakfast. At least, my fellow Travelers had second breakfast. I was probably feeling the effects of the altitude and didn't eat. I had hot chocolate though, since as Harry Potter's Professor Lupin told us, chocolate will make us feel better, and it did. We were now up over 9000 feet. Now a note about the Equator. One, we'd already been on the Equator in the Galapagos but there's no monument to it. Two, I find longitude and latitude fascinating and I happen to live on the 42nd Parallel. In fact, many of the photos in this blog have been taken in an area where you can go stand on the marker for it. 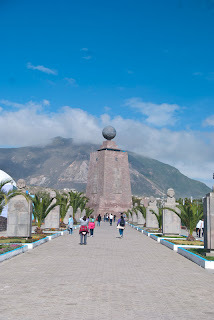 Three, there are two museums right next to each other here that offer you the opportunity to stand on the equator. One is Ciudad Mitad del Mundo. This one is where most people end up and that's a shame since its not really on the Earth's actual equator (this was discovered with the advent of much more precise GPS measurement tools). The actual Equator is located 240 meters north. 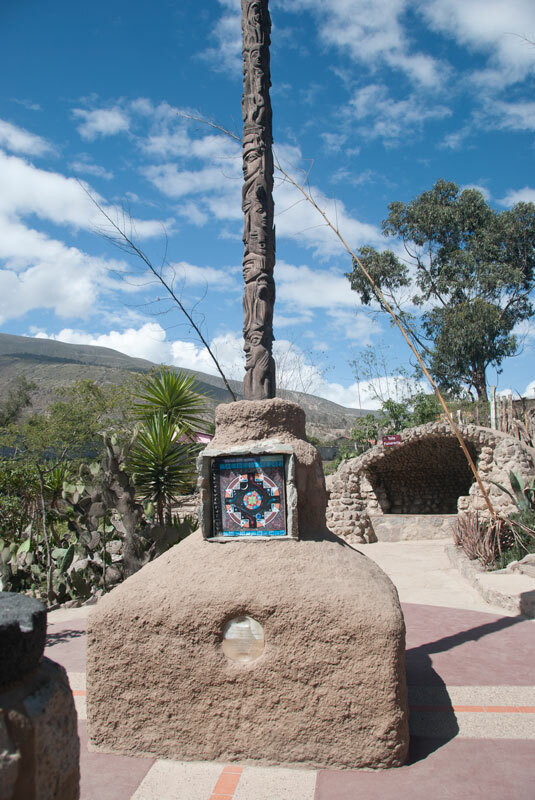 And there you can go to Intiñan Solar Museum. This is an ethnographic museum as well. 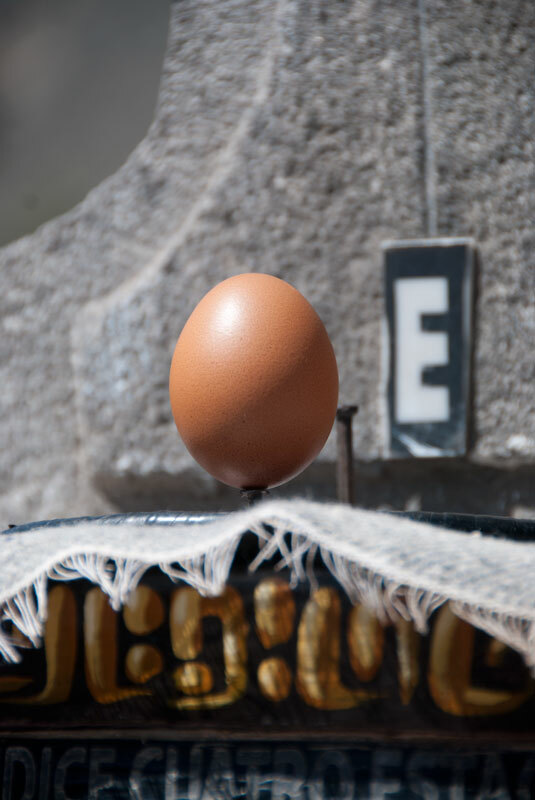 This is a much more fun Equator experience where you can perform experiments testing the Coriolis Effect, test your balance and strength while standing on the Equator, and even try balancing an egg on a nail, which is allegedly only possible on the Equator. We four Travelers also passed the guinea pig test. Traditionally, people kept guinea pigs (or cuy) for food. If the cuy were quiet when you entered a person's house it means you have good energy. If they made noise it meant you had very bad energy. We four had no idea there were many guinea pigs in the room until they were pointed out and thus we passed the test. We exude good energy it seems. 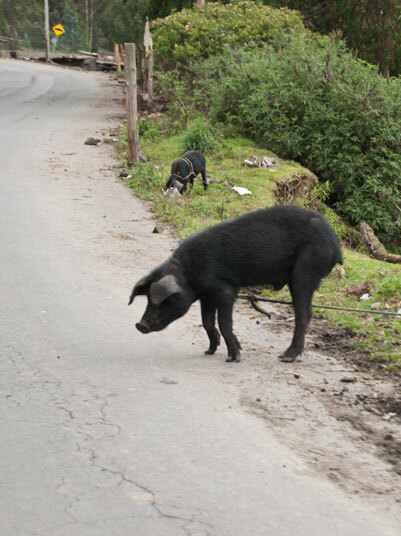 We headed through Quito. We didn't have time to stop and see the sights as we had a very long drive back to Guayaquil and we wanted to enjoy as much of the Avenue of Volcanoes during daylight as possible. Of course, we stopped for lunch first. 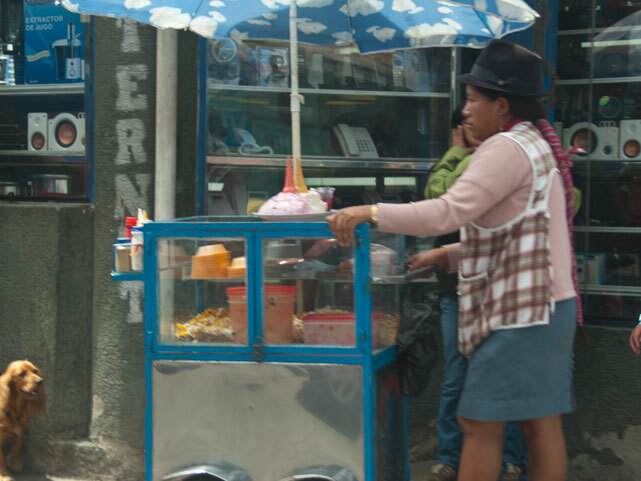 Quito. An improbable dessert/treat. I don't know what it is but its big. Then the longest and the most spectacular drives I've ever been on began for real. Soon, mountains loomed around us again. Our destination: Cotopaxi. Cotopaxi a stratovolcano rising 19,347 feet above sea level. It is one of the highest active volcanoes in the world. It is the second highest peak in Ecuador and is covered by one of the few equatorial glaciers in the world. 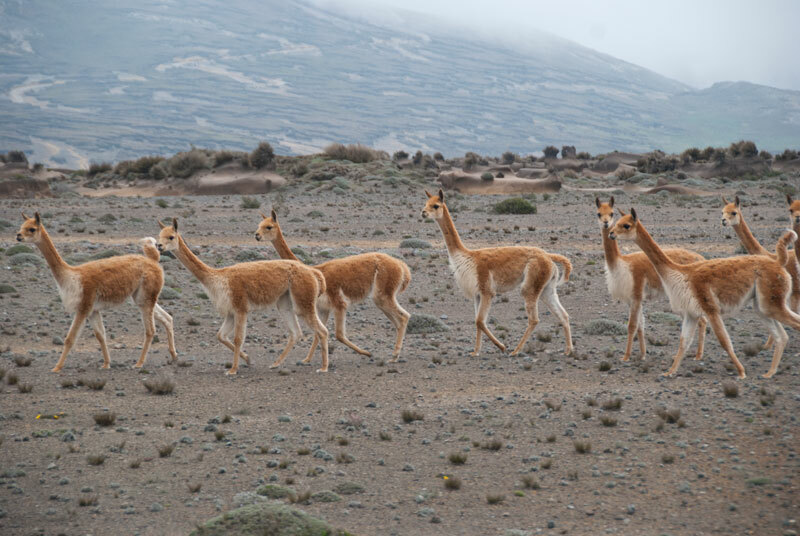 Cotopaxi means "smooth neck of the moon" and was revered by local Andean peoples as a "rain sender' and a place where the gods lived. Having paid homage to Cotopaxi it was now time to find Chimborazo, the highest peak in Ecuador. You would think a peak rising to 20,564 feet above sea level would be easy to find and see. It probably is if you don't get lost. We did, sort of, but as I always say sometimes you have to go the wrong direction to get where you are supposed to go and that is exactly what happened. 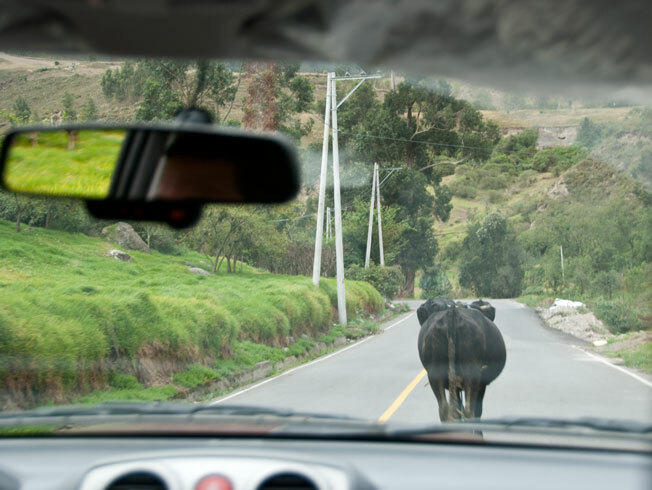 Traveler Nine was driving and took a wrong turn in Ambato that ended up being the most right turn there ever was. We drove through the most beautiful river valley, following the river as it twisted and turned through high peaks around us. Farms lined the road and rose up above us on the slopes. Crops were planted on improbably inclined fields. I don't know how any one plows and plants fields on such slopes. I wondered briefly if they had to repel down by rope to harvest the potatoes. 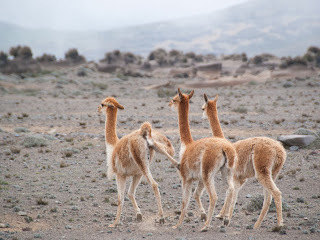 We saw every manner of farm animal, including llamas. 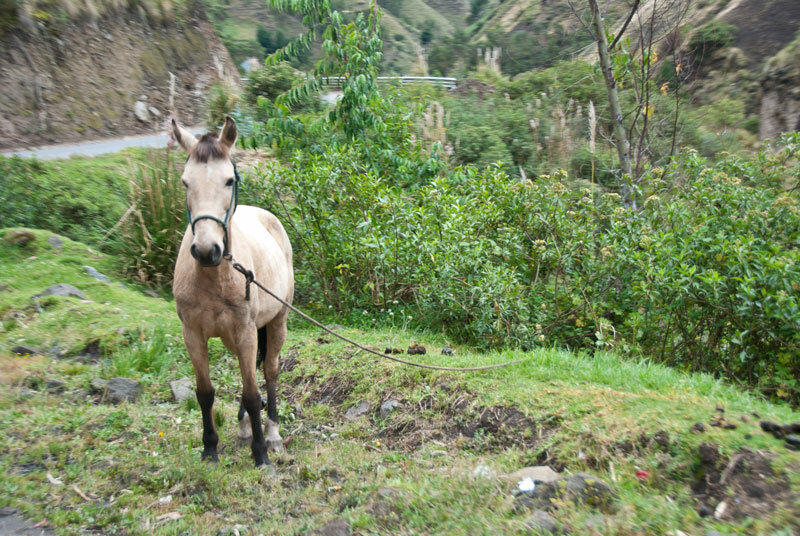 We saw people on horse back herding cattle and sheep also at improbable heights and on impossibly steep inclines. The valley got wider and wider. We were now up to around 14,000 feet above sea level. Suddenly the road ended. And there was Chimborazo right there in front of us capturing the sky and clouds. 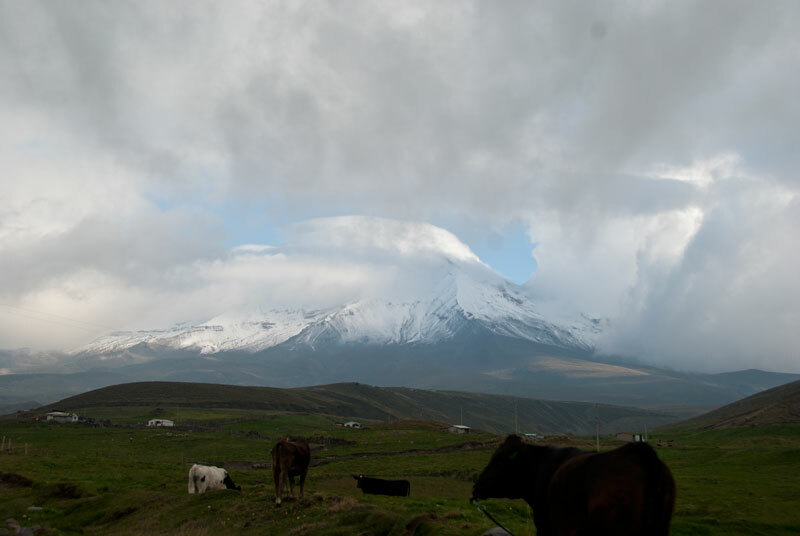 Chimborazo is also a stratovolcano but long dormant. 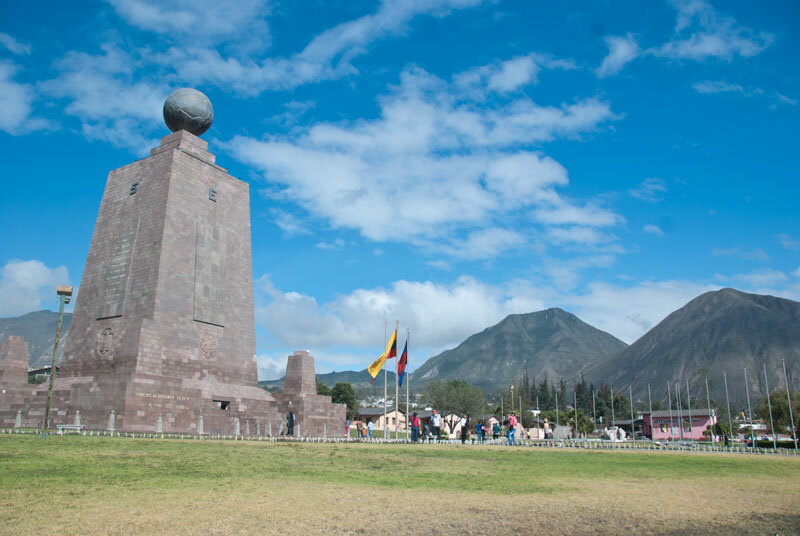 And not only is it the highest peak in Ecuador, it's summit, because of the equatorial bulge, happens to be the farthest point on the Earth's surface from the Earth's center. 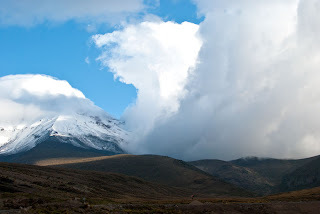 This also makes Chimborazo's summit the point closest to the sun on the Earth's surface. 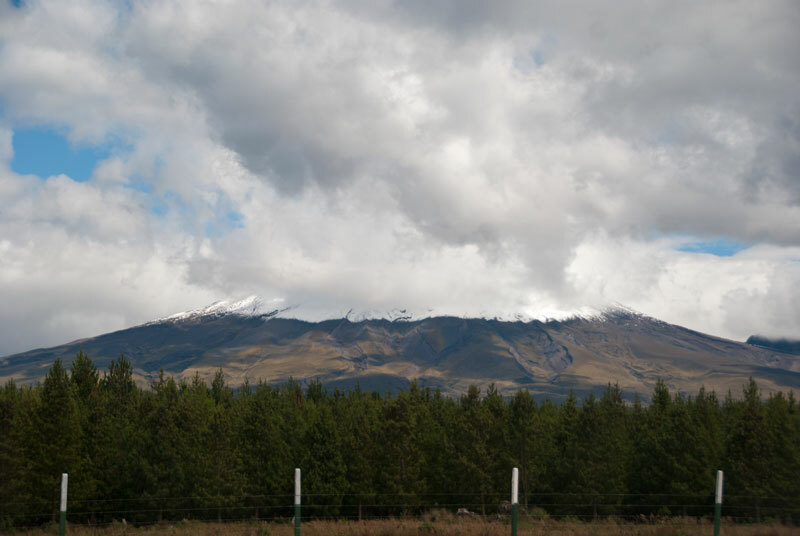 It, like Cotopaxi, is covered with a glacier. 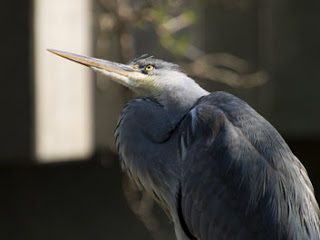 Many of the meanings of its name in the languages in the area refer to its ice covered slopes. We were now in extreme highlands. We drove across this alien landscape of strange humps of dirt and tufts of gray-green grass. 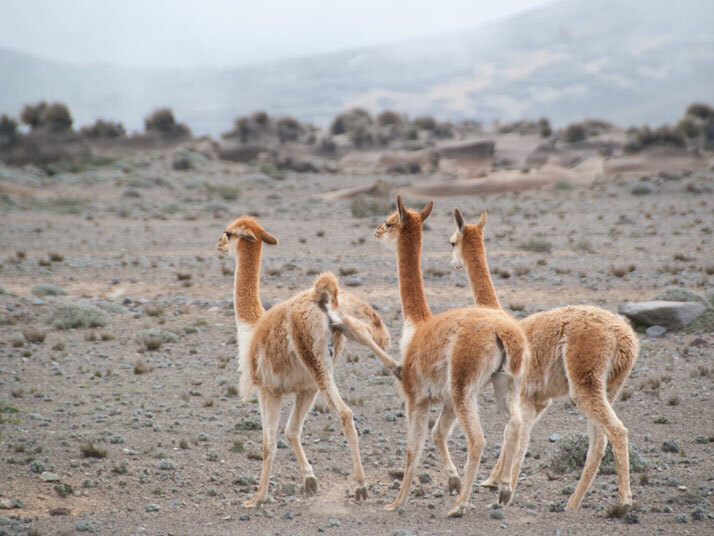 We passed herds of wild vicuña. Or perhaps they passed us. 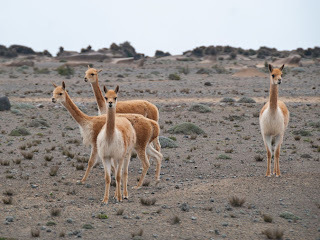 Vicuña are a wild relative of the llama. 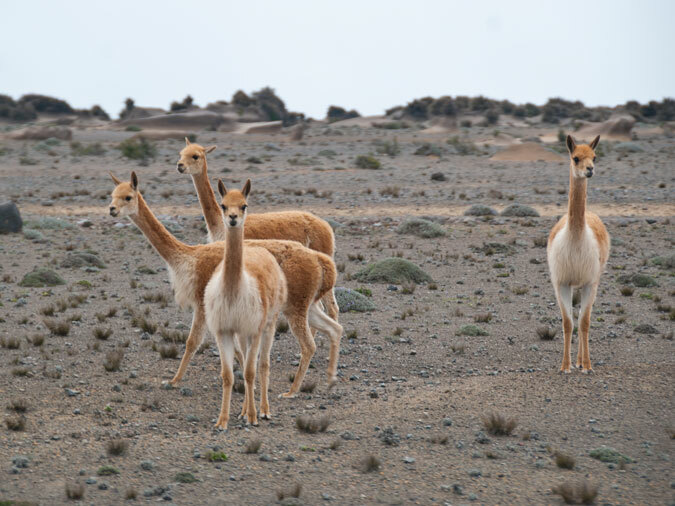 Once seriously endangered, vicuña numbers have grown considerably with the help of conservation and reintroduction efforts. 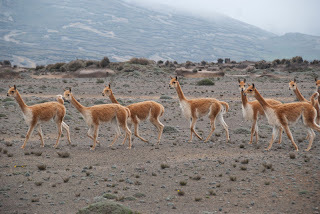 Shortly after seeing the vicuña we passed into an area of thick fog. Here were began our long descent toward the coastal plain. It was now early evening. Down and down we drove through village after village and town after town. We had now been on the road for over 12 hours. We were tired and hungry and somewhere near the city of Babahoyo we lost our minds. Traveler Nine asked what we wanted for dinner and we all said pizza. 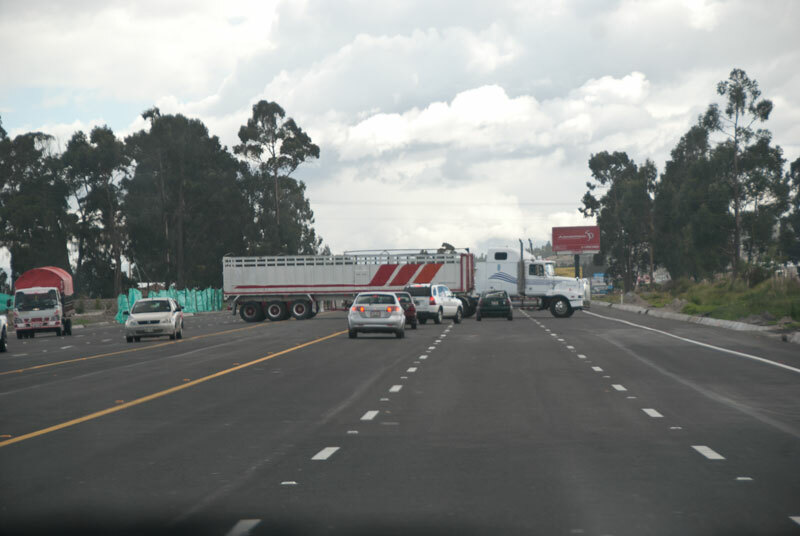 As we drove into Babahoyo we were chanting "Pizza! pizza! pizza!" on the top of our lungs. We ended up asking a woman and her daughter driving a Vespa where pizza could be found. They gave us directions. Seeing us get lost they followed us, waved us down, and then led the way to pizza. We had pizza sitting out on the sidewalk, which was covered in giant crickets, in the middle of Babahoyo. We were happy. Now those crickets...I have a colorful history with crickets that included a riding accident, ambulance trip, and a stay visit to the ER that involved me being covered in crickets. I seem to attract them. 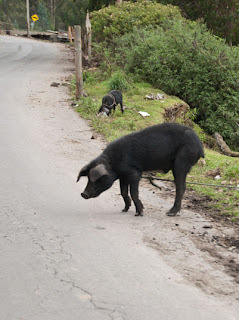 In Babahoyo they got into my luggage, which I discovered once I got back to Travler Nine's mother's house. I apologize if the house is now infested with giant crickets. Maybe they can keep the nice lizard living near the window in the bedroom I slept in company. 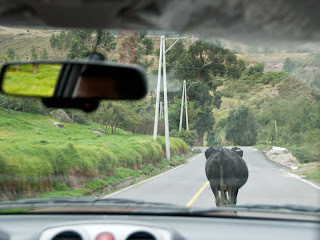 We still had quite a ways to go to get to Guayaquil. I took over navigating. Traveler Nine and I got us to Guayaquil though I think we drove in circles outside the city for a while thanks to collective delirium brought on by exhaustion. It did give us the opportunity to see an owl hunting though. It was almost 11 pm when we got "home." Then it was time to repack everything (which is how I discovered the crickets). Travelers Ten and Thirteen and I were leaving for the US the next day but not without having one last adventure: A day in Lima, Peru!